You might remember I contacted you a while ago about the difficulty we have purchasing power banks from the mainland here in N. Ireland, and you discussed the issue in some depth on the podcast. Just wanted to let you know I came across one product on Amazon which doesn’t have the dreaded red “No delivery for you” warning. Not sure if this is an oversight or if there is some specific reason why this one is not restricted. Thanks again for the podcast and product reviews. Keep up the good work! Was up with apple. They reckon it is a firmware issue specifically the interface between the battery and the power management software. They did a software and firmware reset so I’m just restoring my content now and hoping for the best! The battery is constantly feeding into to the power management software through the firmware. If the firmware isn’t working properly it causes mini crashes and is constantly resetting itself and sucking away the battery. The guy I was speaking to was very helpful and he could see that there was a problem (it dropped 3% during the battery diagnostic test). He reckons it was the firmware as I have already wiped and restored the software and the actual battery checked out fine. 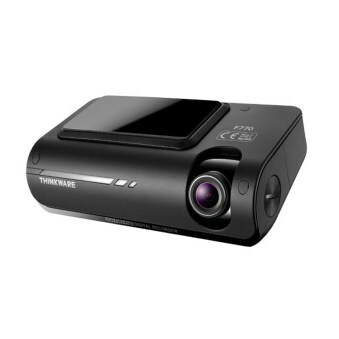 Thinkware are pushing the boundaries of what dashcams can do and cost. The F770 is one of their more attractive offerings and a newer the F800 is about to arrive on our shores. The F770’s mount sticks onto your windscreen directly and I’m sure a number of users will be instantly put off the device. No suction cup has been included, only a piece of 3m tape. The mount is a simple piece of plastic with a few clips that click into the main camera’s body. It is common sense to avoid obstructing the field of view of the driver, so the recommended location for a dash cam is behind the rear view mirror and as you can see from the below picture the THINKWARE F770 is totally hidden behind the rear view mirror from the driver’s perspective and looks like part of the original equipment. If a suction mount was used this would not be the case. More importantly the decision was made due to legal considerations. If you use a suction mounted car camera in the UK, if the device (camera and / or cradle and / or suction cup) intrudes more than 4cm into the secondary (pink) wiper clearance zone, or intrudes more than 1cm into the primary (red) wiper clearance zone of the windscreen, you are committing a serious traffic offence (dangerous driving) under the UK Road Traffic Act 1988, and your vehicle is not roadworthy (it would fail an MOT).The company selling a windscreen suction mounted car camera has a legal duty to ensure a) that the camera can actually be attached to a section of the windscreen of the vehicle which does not result in an unlawful intrusion of the primary (red) and / or secondary (pink) wiper clearance zone, b) that the screen does not remain on or visible to the driver and c) that the user is aware of the law. If the company sells a suction mounted car camera without doing this, they have committed a crime. Looking at the device, on the “front” you have the camera lens, this rotates through (around) 87° to allow for coverage depending on the angle of your windscreen. On one side there is only a little groove for heat dissipation and the reset button. The other side has a hatch for access to the power socket and the microUSB port. There is also a groove for a penny or tough thumbnail to turn the camera lens. On top, there are more vents for heats and cooling. Two LEDs, WiFi and GPS. Dedicated buttons for Manual Record start/stop, turning off and on the microphone, WiFi on/off, formatting the SD card and the power button. The device turns on when the car is started so this power button is purely for exceptions to that rule. Along the back is the slot for the MicroSD card, some more vents and the hole for the cables for the side hatch. Recording at Full HD 1080p at 30 frames per second. The F770 records at 9.5Mbps bitrate with a mono 48kHz audio track at 728Kbps. Footage is captured to expandable storage and the F770 takes a microSD card and there should be a 16GB card included. A 16GB MicroSD card will store up to 200 minutes of footage. As with most dashboard cameras the recording loops and overwrites the oldest files provided they have not been tagged as an incident. In this case, the footage is moved to a separate folder for safe keeping. The OS on the camera as a few settings to change the storage capacities for kept footage. To connect your camera to your phone the F770 has Wi-Fi access built in. Using Thinkware’s app a simple ad-hoc connection it made and the two devices shake hands. Connecting to the camera with your phone allows the user to stream the footage live to the phone, personalise the settings, and align the camera so image captures as much as possible. Other settings include the sensitivity of the G-sensor, configuring the Parking recording, silencing warning for lane departure and speed zones. Remarkably this is a handy feature that turns off the device input voltage drops to avoid draining the battery in standby mode. A special Dual save function is also included whereby built-in memory is used for incident recordings, in the even the removable memory is damaged you will still have the files. A good backup consideration. Footage shot on the Thinkware Camera is good, a fine example of how paying extra give the user a big step up in quality. Night video is also acceptable with no blobs of light or underexposure. Crucially there are no lost frames either. The 30fps is consistent. Footage can be seen in the Unboxing video above. GPS has been built in and location data is added to the footage. This can be viewed using desktop software. It all sounds great, what the catch? The warnings are a pain, the camera will shout as you if you slip over the speed limit, and one occasion the camera’s speed limit database is incorrect. A bong will sound when changing lanes and whilst this is great for a tired driver who might drift, it can be irritating when on a long motorway drive. One gripe I have with this and most other cameras is the power cable, at the one end is the connector for the 12v socket however as in some cars there might only be on 12v socket the dashcam will monopolise it. I have a phone charger and Bluetooth hands-free kit that sit in a three port USB converter with my current dashboard camera, however, the Thinkware has upset this happy arrangement. It’s pricey and gets pricier if you want a rear camera as well. For the money, I would have expected a better mount, rather than have a lump of plastic permanently attached to the windscreen, it’s a relatively small footprint, but makes this difficult when you sell a car or want to switch the camera to a second car. The Thinkware F770 has a few shortcomings however it’s indiscreet and produces the goods. It’s up there with the best of them and if you are purchasing then you better be sure this is the one for you.